Although, there exists an advanced hack you can implement to insert an ad in the middle of a Blogger post but I'm sharing with you in this post, a trick that simply involves the use of Blogger's "Post Template" feature. According to research by Naijaxnet Blog. There are series of tutorials online on how to place Adsense below Blogger post title and at the end of Blogger post but you will hardly see tutorials that will explain how to easily place adsense or affiliate advert in the middle of a Blogger post. This is simply because it's not something you can easily achieve by copying and pasting your ad code in your blog's html. Post template helps save you time by pre-formatting the post editor. You can use it to format your posts in a certain way. Hence, you can also use it to automatically display your adverts in the middle of your posts. ==> Log in to your Blogger dashboard and go to Settings > Posts and comments, then click Add next to Post Template. ==> Paste your ad code in the box and save. (No need to parse the code). 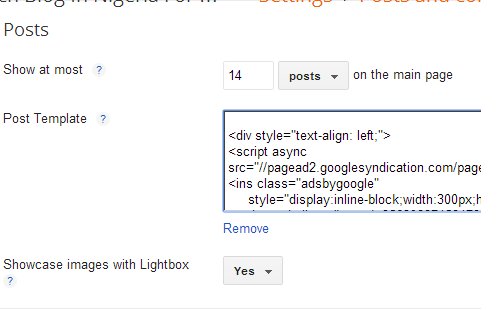 When next you need to compose a post, click on the "HTML" tab of the post editor to see your ad code. Type your post content above and below the ad code, so that the advert will be in the middle. When you are through with typing the content, you can click on the "Compose" tab to easily add links etc to your post. When you are done, publish your post, view and you should see the ad in the middle of the post. NB: The ad will not display in old posts but automatically displays on the Blogger mobile view.